How is data is represented and read from permanent storage. through some documented process, at a later stage whatever they needed. this is one of the subject of this episode. filesystem and an emphasis on storage device. What's data storage and what's a file system? search for that information back. exist in memory or networked ones. of attributes like access rights and metadata, etc..
and ways of handling information. of all the components that are involved. those components that are in the middle parts of the architecture. to where it came from. it is not always as simple as that but it gives a picture of the flow. HDD or SSD or DVD or SD or Flash, etc..
which is usually a SCSI or ATA cable. block could be 4096 bytes (this is related to the filesystem). management or the MD driver on Linux, RAID for redundancy, etc..
out to the physical device or used to cache some of the disk I/O. mind all along as we're going to dive into everyone of them one by one. Let's talk about the hardware. is a block/cell of bytes of a certain size. have it abstracted by the software and have no physical delimiters. and writing information more efficient. important to know the physical layout of a disk. has two faces, each face is called a head. also divided into smaller parts that are all the same size called sectors. or optical disks, not only hdd. back and forth to CHS. average time it takes is called the seek time. This time is quite big in computer time, from 5 to 10ms, it's very slow. have the same issues as with HDD and other medium. > between 0.08 and 0.16 ms. In sum, this is the layout of a hard disk and what it implies. checksum, check the integrity and health of its own data. This is done through error-correcting code and bits. HDD, SSD, optical disks, etc.. all have those. The command that can show the physical sector size is the `fdisk -l`. Now we can move to the connectors, the interface with the physical medium. Let's focus on what those connectors are and what they do. the disk or other device - the hardware interface. here, the SCSI interface, the ATA interface, and the BIOS interface. would guess is a bit slower but more convenient than the direct access. and/or write caches parameters. Remember that. Wait, We know what's a BIOS but what the hek are SCSI and ATA? it can be used for CD drives and scanners or anything else. devices can communicate with each others. have a distinct set of pins to send the data over. ATA stands for "AT Bus Attachment" or simply "AT attachment". Attachment to avoid trademark issues with IBM. updates. It was first a response to SCSI's flaws. IDE, one of those version iteration names is sometimes mixed up with ATA. commands to the ATA disks over the ribbon cable, the channel. separate controller on or connected to the motherboard - like with SCSI. The interface that an IDE uses is the ATA interface. a controller in the motherboard so can be used with everything. protected area, the max address, the device configuration overlay, etc..
At some point ATA and SCSI started to bottleneck, they were getting slow. ATA was renamed parallel ATA or PATA for short. Reduced cable size, faster speed, reliability, among others. laptops, 99% of the market share as reported in 2008. Now the question is: Can they work together, are they compatible? packet interface which would allow ATA devices to speak SCSI. which allowed ATA commands over SCSI bus. be connected on a SAS backplanes/controllers, but not the reverse. this standard is called the SCSI/ATA Translation (SAT). devices other than hard disks. So ok, that was a long overview of the hard disk world. set the hardward cache, etc.. and get info about those drives. How is it done on Linux and the BSDs? Each SATA port on Linux will apear as a SCSI bus. lower operations that are translated to other SCSI-like services. loaded and not a module. device? More or less yes. controls the device and not the actual device itself. for the third disk, etc..
numbers 8 and 65 through 71, etc..
`/dev/hd` is used for the IDE subsystem. `/dev/sr` for cdrom subsystem (iso9660). you can get more details about the SCSIs by checking `/proc/scsi`. That's enough about Linux, now what about BSDs? We'll take FreeBSD as an example. ATA disk driver and the SCSI direct access driver. the ast ATAPI for tape drive. like Linux but very separate ones. USB mass storage as `/dev/da*`. so all those devices are character devices. it is read before or written to before the real device. device has a buffer in the block layer. This is what a block device is. cache than the filesystem cache. This layer has some queuing and scheduling put in place too. However there are a lot of criticism about it. 1. Some ATA devices already provide built-in hardware caching mechanism. 2. Like all caches it's stored in the kernel and add complexity to it. frequent housekeeping of the data structure. 4. In case of crash the data might be lost and unrecoverable. mixed up with the page cache too. Linux 2.4 are joined (somehow, we'll discuss page cache later on). You have to do `sync; echo 3 > /proc/sys/vm/drop_caches` to drop them. Yes this is a bit confusing. the appended digits and characters we haven't discussed, what are those. Let's talk about partitions and volumes. as you'll see those fit together in the same basket. having multiple operating systems on the same disk. however they shouldn't be mixed. disk. The operating system will see them as one big block, a volume. a volume which can contain logical partitions. partition called an extended partition should be used to have more. Check the podcast about booting on Unix for more info on that subject. Now how does the addressing works here? have to be the start of the disk. That's a lot of blocks stacking up. software implementation or a hardware one. This could consist of a specific volume management driver or of RAID. Let's discuss some software implementations. It can also be used for disk encryption (dm-crypt). (logical volume management) and MD. between each logical extent and the physical extent. What about RAID, the redundant array of inexpensive disk. * RAID 1 is pure mirroring. * RAID 2 adds some error correcting codes. * RAID 3 adds a disks that calculates the parity of the last bytes. * RAID 4 is like RAID level 3 but using block sized chunks. discussed, apart from the SCSI and SATA we mentioned earlier. It adds volumes and partitions to the mix. On Linux partitions are represented by additional numbers added. on it `/dev/sda1`, second partition `/dev/sda2`. GPT or one of the 4 main partitions. On FreeBSD it's a bit similar. "slices", then has logical "partitions" inside the slice. SATA drive, `/dev/ad1` the second, etc..
"s3", "s4" after the drive in question. `/dev/ad0s1` and for the second slice `/dev/ad0s2`. all the other partitions on the disk, "d" covers the whole disk entirely. directory points to this devices. In simple terms that's what a mount point is. `/tmp` and whenever you write data to `/tmp` it'll be on `/dev/sda3`. I won't go into more details. How does the OS know where to find them? podcast about booting for more details, or just read up online). "here is an ext4 filesystem". or object present on this partition. There's a list in the show note (`partition_type`). But what's actually inside the partition we are mounting? and a lot of specific filesystem components. /dev/sda1: PARTLABEL="BIOS boot partition" PARTUUID="093c568a-be66-4475-99b6-a70dc67f635d"
/dev/sda2: UUID="78b19097-1d52-4c9f-b076-813bfff87118" TYPE="ext4" PARTLABEL="Linux filesystem" PARTUUID="5e2787ff-023d-4768-aeda-c268b5909c5b"
about it, how can it be implemented, and what are all those metadata for. is the file system type. The file system is the way the OS store, update, and retrieve the data. Ah that sounds repetitive, we've already said that it seems. But this time it stores the data in a hierarchy of files and directories. so that the OS knows where to find them and what they represent. system that some banks have, well this is the job of the file system. access to them, it organises them, keeps the office tidy, etc..
to be able to find it as fast as possible. organization: The metadata and caching. implementation of file systems in the Unix world. not on sectors. Those blocks range from 1 to 128 sectors (512B-64KB). the block and taking it entirely, even if the file doesn't fill it all. phenomena is called internal fragmentation. of what is on which blocks. and the structure that represents the files used on which blocks. Those are the permanent structures. or anything, this depends on the implementation. pinpointing the files on the disk and letting the OS access the files. file's contents", the inode pointer structure. as the root directory inode. is considered full, even though the disk might not be. list of pointers to the disk blocks. file, how do we do space management. Well, obviously this is file system dependent. block found, or the best fit, or the worst fit. You can mix those around. on the disk, the file blocks are scattered around. it has to allocate a new block that isn't contiguous. the disk too much and slowing reading speed. be reading all over the disk. to store the file information. linked list of pointers to next blocks, etc..
block pointers and 3 indirect block pointers, single, double, triple. The combination of those means that the file can grow as it needs. What about the in-memory structures we mentioned. where the user's next read/write will start, the access rights, etc..
keeping track, in every process, of the files taht are currently opened. sometimes at the virtual file system level. both the hard disk page size and file system block size. cache caches disk blocks to optimize block I/O. It has confused me too and I'm not sure the differences are clear here. is very important, the dentry. What can differ from one file system to another. fetch, if it has some specific features. if suballocation is not used. used with Btrfs and FreeBSD UFS2. consider identical block as the same block and not reallocate it. The HAMMER file system implements this. there should be a way to recover. The Ext2 file system, for instance, has integrity check. Ext3 has journaling and ReiserFS too. Some file systems have a snapshot feature, allowing to backup and rollback. For example ZFS, HAMMER fs, and Btrfs implement this snapshot feature. ZFS and Btrfs also have those. There are file systems optimized for specific devices and usages. others for network, others for encryption, etc..
and fsck for checking a file system integrity. There's also GNU parted that can be used to create file system. a certain limitation for their file size. but rather indirectly from ISO/ANSI C.
guess what the issue is. limits the size of a file to 2GB." a discussion for the advocacy lists." superblock, a clump of inodes, and the data blocks. structures. What was new was the simplicity over functionality. have a superblock aka volume descriptor, a block pointer scheme, etc..
different types of file systems together. a file system via a common interface, a file system interface. This is called the common file model. Where does the concept of VFS come from? microsystems in SunOS 2.0 in 1985. NFS transparently from the same usual system calls. for them, for instance MS-DOS FAT was developed for SunOS. Release 4 and later implemented in 4.4BSD and derivatives. implementation to allow support for different kind of file systems. But how does the VFS work, how does it know which file system is present. 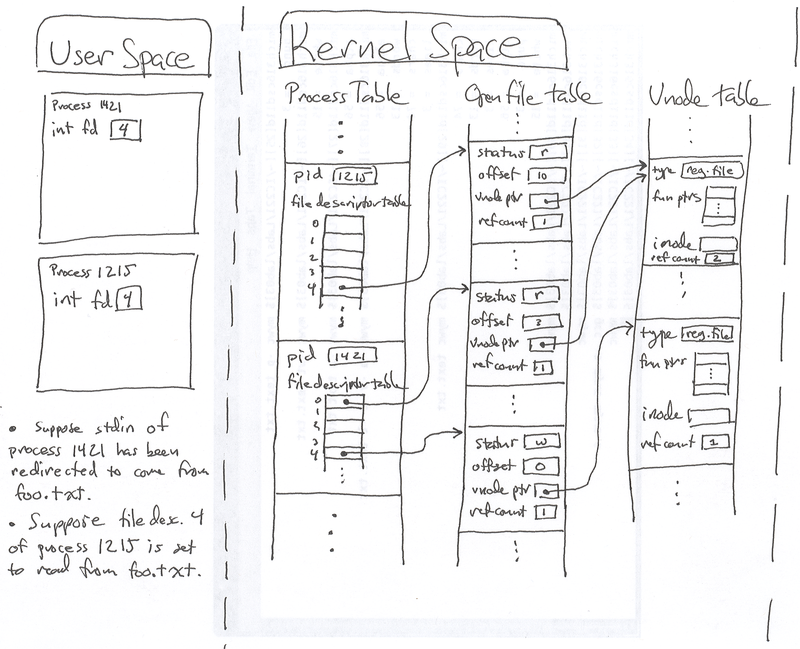 The real file system stays as a driver or built-in the kernel. The device that contains that file system, the partition, etc.. The file system type it is. the inode of the directory it's currently mounted on. The block size of this file system. of routines used to interact with the file system. information of the underlying file system inodes. and the block buffer layer (or whatever abstracts is like map-device). frequently used directories can quickly be found, the dentries cache. caches are kept in memory and not permanently. like from the side of the user? In short, it provides the basic POSIX file I/O functions. buffered through the block layer if any and then goes down the pipeline. mount devices, change metadata on files, etc.. It manages the open file table entries, and per-process file descriptors. The POSIX I/O is great but sometimes criticized for what it's good at. real time I/O is in need. Although its strong point is consistency and portability. Analysis", it's a great resource. of tools for forensic analysis. corruption to retrieve the files on a disk. backups before playing with them. data storage architecture on Unix. and abstraction of the data passing through. It all represents abstracted access to data. to the virtual file system, to the POSIX file I/O. I spent a pleasing hour, thank you. If I understood it, there is quite a lot between the application (top), and the VFS (just under) that is not described on this diagram, (file table, with locks...). I wanted to have quick access to all files names (through find /), and now I know that it is cached to the direntry cache of the VFS. It feels good to know where things goes. I will probably come back to these podcast as I need to check info back. Like for a lecture with an associated book :). (15-10-2017, 06:23 PM)josuah Wrote: If I understood it, there is quite a lot between the application (top), and the VFS (just under) that is not described on this diagram, (file table, with locks...). The goal of the podcast was to go from the bottom layer to the top so that anyone could grossly grasp this kind of schema. It seems like it's not doing that bad of a job at that. Yes, what you're mentioning are kernel data structures. This Linux Storage Stack Diagram focuses on storage and what you're mentioning is not really part of it. I have missed the pod, glad your recording again! I always listen to your podcasts multiple times due to the high density of quality information. Excellent shownotes/linklist. Keep it up Venam, the Man! (16-10-2017, 09:48 PM)budRich Wrote: I have missed the pod, glad your recording again! I always listen to your podcasts multiple times due to the high density of quality information. Excellent shownotes/linklist. Keep it up Venam, the Man! Feels good to hear that kind of feedback. I had some trouble organizing the linklist for this episodes into categories like I normally do. While preparing it I wasn't sure of the order in which I was going to tackle it and the brainstorming became nasty. Someone recently asked after checking this podcast "But what and how do USB fall into that, I got a HDD over USB". In the podcast I only went over the physical HDD directly connected via SCSI or ATA but it's mostly the same for other inputs. What you can understand from this is that there's a new layer of translation. Thanks for opening thte knowledge tap. That is clear now. Another very useful command on Linux I forgot to mention is the device manager commands. Which returns a lot of the info we mentioned, hardware type, its configuration and caches, connector type, fs type, driver major & minor numbers, etc..
Readed part of the transcription, I'm going to listen to it tomorrow!